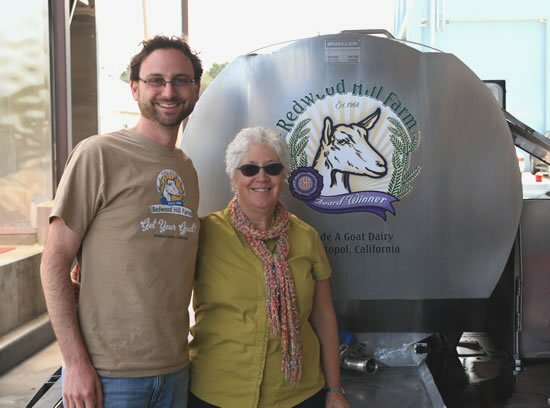 Over the past couple of years, I’ve been getting to know the folks at Redwood Hill Farm, a small family goat farm and creamery in Sebastopol, California. Last year, they sent Matty and me a wonderful assortment of cheeses to serve at our wedding. 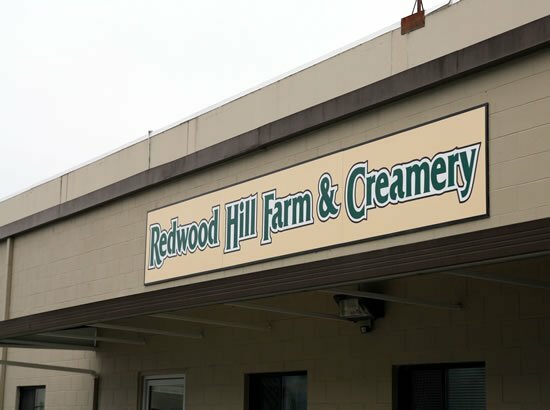 Earlier this year, we worked together to organize a cheese making workshop in which Jennifer Bice, Redwood Hill’s owner, enthralled a group of my fellow food bloggers by making goat’s milk ricotta. And, they sponsored my attendance at Camp Blogaway, a food blogging conference in the mountains near Los Angeles (showing up with two huge boxes of cheese, yogurt, and kefir is a great way to make friends at camp!). I’ve known for a while that they are the “real deal” when it comes to humane treatment of their animals, stewardship of the land, and of course delicious cheese. So when Jennifer invited me to come up to the farm for a tour, I jumped at the opportunity. I invited my friend Jim to come along (you may remember Jim from his guest post last year, “So you want to be an urban farmer“). A few days after our tour, he officially left Southern California to start his own farm in Coloma, CA (between Sacramento and Lake Tahoe). He also took most of the photos you see here (thanks Jim!) and now, thanks at least in part to this field trip, is planning on getting some goats of his very own. We started with a tour of the creamery. Then after lunch we visited the farm, which is just a few miles down the road. I’m splitting this tour up into two posts, in the same order, so you’re just going to have to wait until tomorrow to meet the goats! Redwood Hill was founded in 1968, just four years after the Bice family left Los Angeles to live “in an apple orchard in the middle of nowhere.” Jennifer’s parents had read the “The Have-More Plan,” a popular homesteading manual from the 1940s, and it convinced them to get out of the city and live off the land. Jennifer was just ten years old at the time and quickly fell in love with the goats, which were the commercial aspect of the farm (they also kept chickens and ducks for eggs, and raised pigs for meat). When she was a kid, she pretended they were in the circus, and taught the goats to jump. Jennifer and her late husband Steven took over the farm in 1978. The company has continued to grow, and today they have 58 employees. 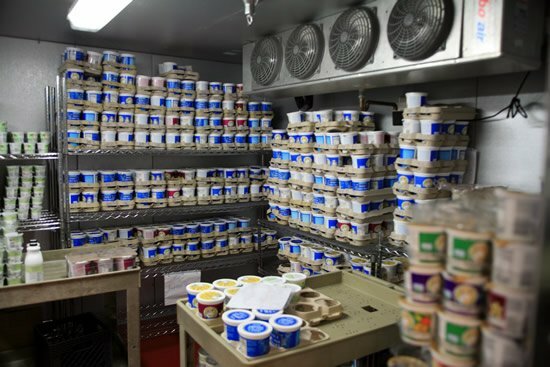 There are three separate processes at the creamery: Yogurt, kefir, and the cheeses. They work in cycles, making different products on different days of the week. 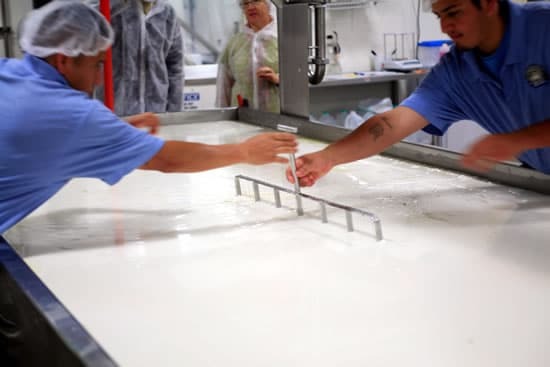 On the day of our visit they were making Raw Milk Feta. 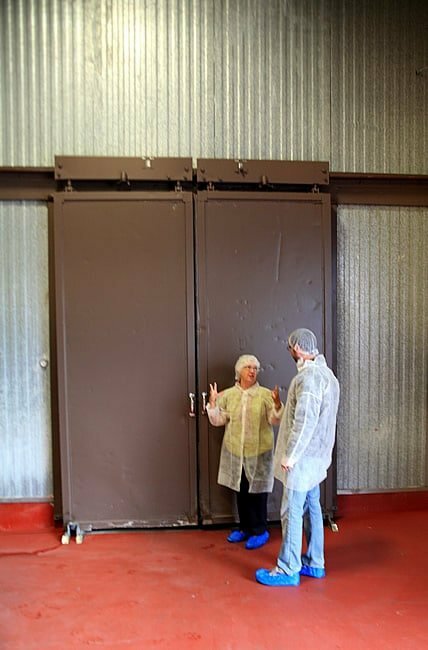 Walking in to the cheesemaking room, we were greeted by 950 gallons of goat milk that were just starting to curdle. 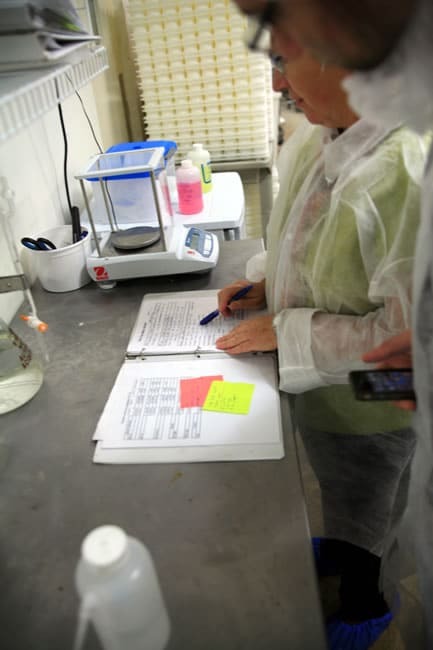 Jennifer showed us the log for this particular batch of Feta — including the meticulous timing, pH, and temperature notes. 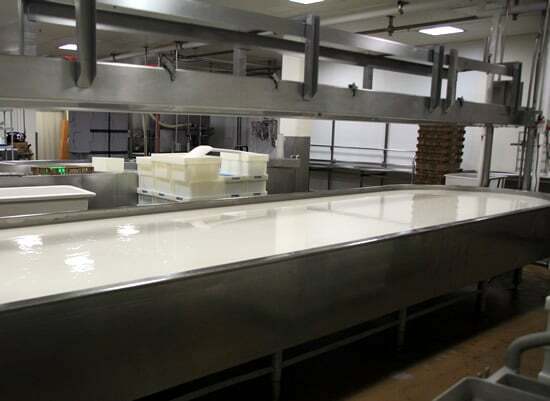 From the paperwork, we could tell it would be a few more minutes before the curds were ready to be cut. 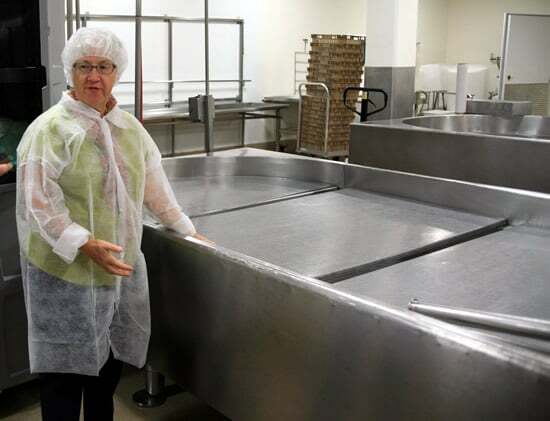 While we waited, Jennifer showed us around the rest of the cheesemaking room. On Tuesdays, they start the Chevre. They add the curdled milk to draining bags and set them on these perforated trays to drain until Thursday. They collect the whey as it drains, and give it to a local farmer for his pigs. After the curds had fully set. Erick (left) and Willy came over and used cheese harps to cut the curds. 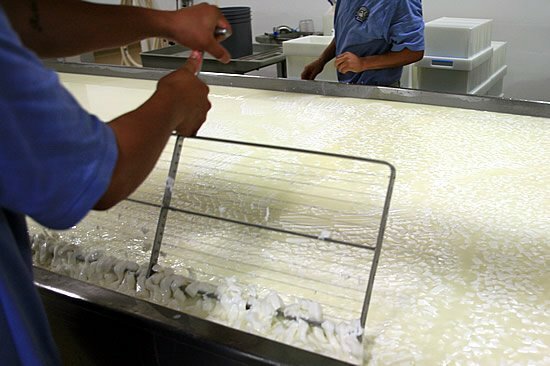 Working as a well-choreographed team, they passed the harps back and forth, slicing the curds into small pieces. 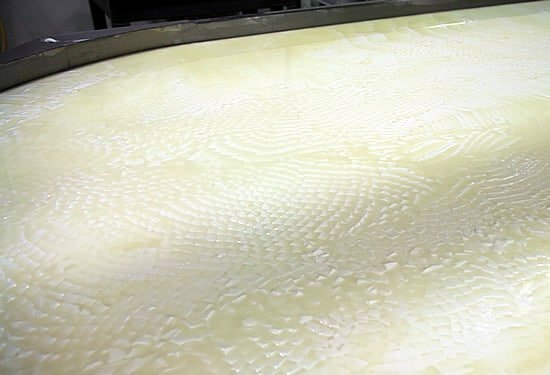 By using a frame with vertical wires, and then another with horizontal ones, they’re able to cut the curds evenly throughout. 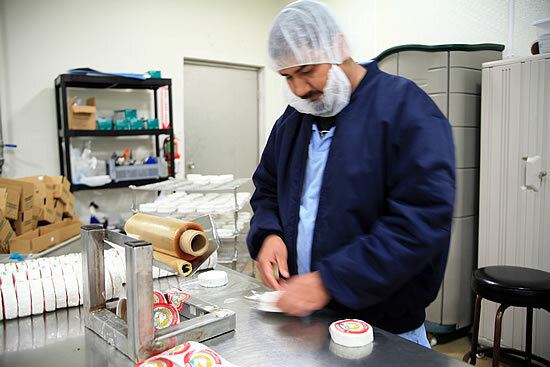 Inside their custom-designed aging “cave,” the Feta is brined for several days. On the left are the covered tanks of brine. The pipes on the left side are for refrigeration — they contain cold water, and keep the room at a constant temperature and 96% humidity. 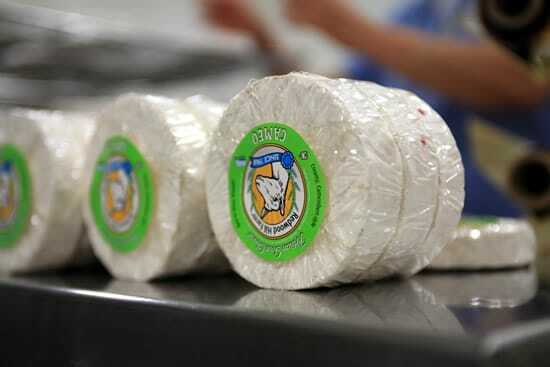 After the Feta is brined, it’s packaged and then aged for six months to a year. Jennifer’s favorite way to enjoy their feta? Bake it with olive oil and herbs. 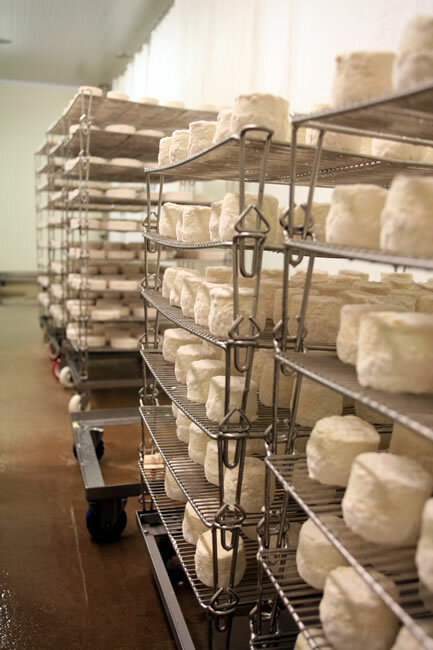 On the other side of the cave, we found racks of California Crottin, patiently developing their rinds. This is about a week’s worth of cheese. 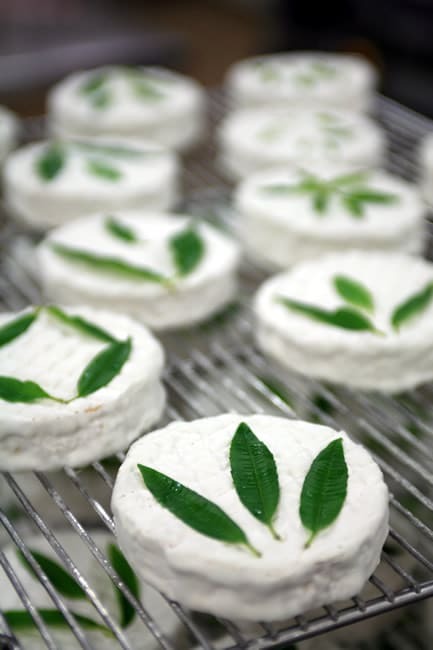 Another of their cheeses is the Cameo, a Camembert-inspired cheese topped with fresh herbs (from the farm, of course) and red peppercorns. Roselia adds the herbs by hand. And then wraps them up, ready to go! Luciano is at another table, wrapping and labeling the Camellia. After the feta-making, we walked over to the fermentation room. To make yogurt and kefir, the milk is inoculated with the cultures and placed into the yogurt cups or kefir bottles. It’s then brought to this room to ferment at the proper temperature. 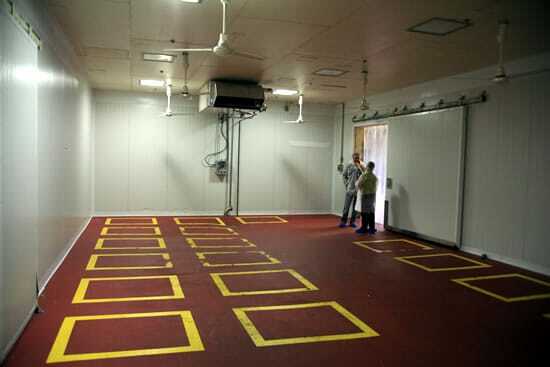 Those yellow squares on the floor indicate where to set the palettes of yogurt or kefir. The room is heavily insulated; the last round of fermentation had been a few days before and it was still quite warm in there. 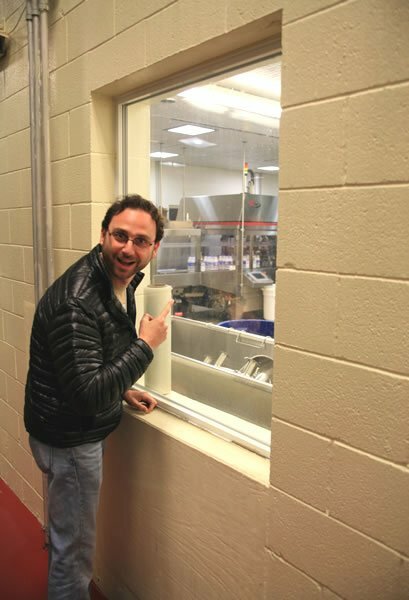 When the fermentation is complete, the yogurt and kefir are immediately brought to the quick-chill room (just on the other side of those doors). They blast cold air onto the containers to stop the fermentation process as quickly as possible. 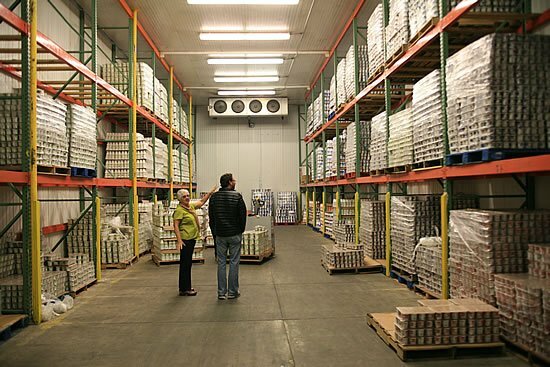 Jennifer then walked us over to their warehouse… that’s a lot of yogurt! 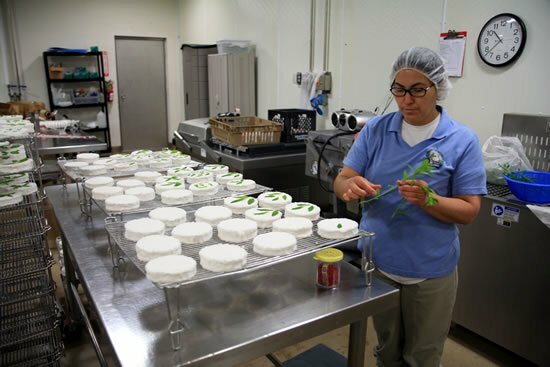 They have an in-house lab for testing, and a separate walk-in fridge where they store samples from every batch they produce. 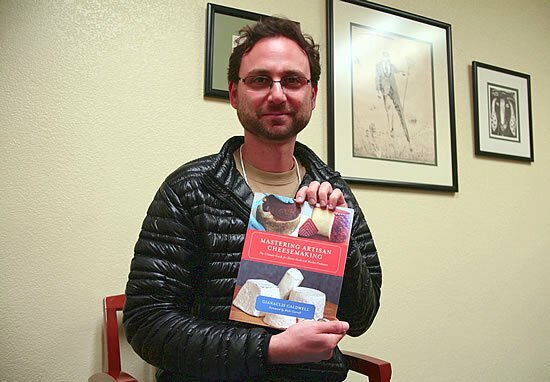 Upstairs in Jennifer’s office, I found a copy of Mastering Artisan Cheesemaking. I think I need to pick up my own copy! 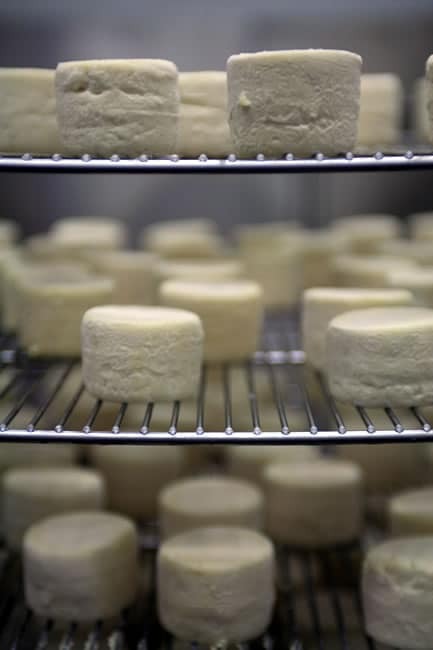 Between heating the milk and chilling the finished product, making cheese is quite the energy-intensive process. Redwood Hill recently installed a solar system that’s large enough to produce 100% of their electricity. It takes nearly two acres of roof space, using 2,500 solar panels. They also have two electric vehicle charging stations in the parking lot! Before Jennifer sent us over to meet her brother Scott at the farm, we paused for a quick photo. I’m proudly sporting my Redwood Hill T-shirt (which happened to be an extra-good thing, because one of the goats thoroughly enjoyed chewing on it!). Come back tomorrow for Part 2 to visit the farm and meet the goats! Fascinating! I am hungry for chevre simply from reading this! Thanks for this review. I have always seen this brand in the stores, but was hesitant to buy it. Can’t wait to read part 2. Since I’ve given up cow dairy, this is the ONLY yogurt and kefir I buy. 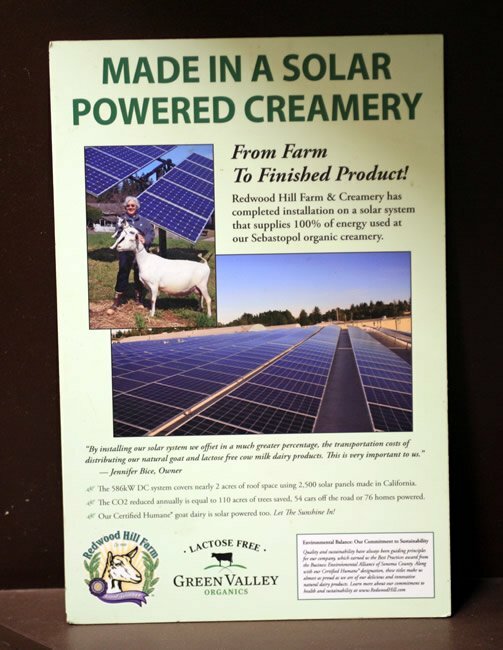 Delicious, and I want to support a company owned and operated by a woman who is dedicated to quality and humane treatment of the goats who supply the milk for their delicious products. A bit more expensive, but simply the best. ok… you had me at cheese, but it got even better. I was wowed by the hand placed herbs on the Cameo. 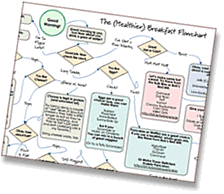 I love what this company is doing and will support it with my buying power. Thanks for taking us along for the fun journey. Sounds like a great place and a fun visit! I’ll look out for this brand at the store!